Last year I made a monogram pumpkin and it was so easy and cute that I decided to do it again this year. This project takes about 15 minutes and only costs a few dollars. 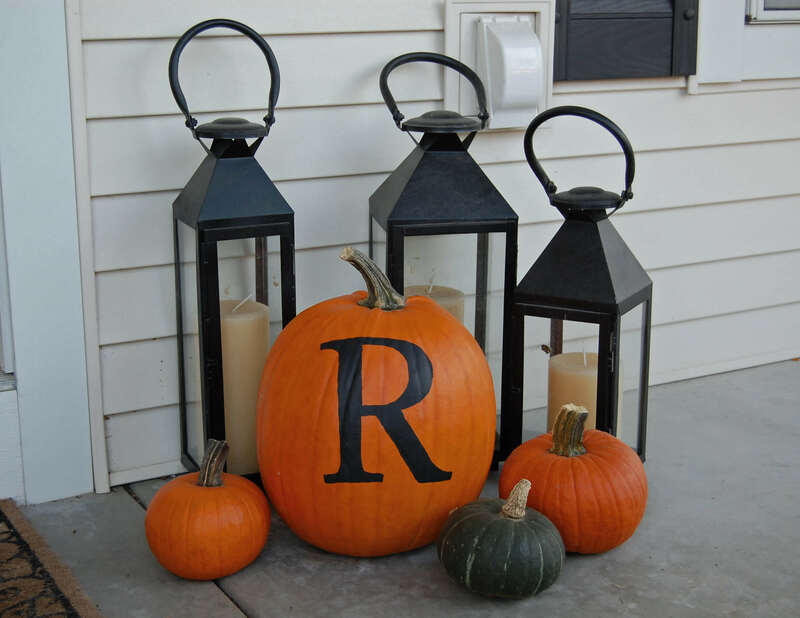 You’ll need a large pumpkin, initial stencil, pen, black crafting paint, and a small paint brush. I had all of these items on hand so my cost was zero! First up, make your stencil. I just printed an “R” on my computer in grey scale. I used Times New Roman size 700. 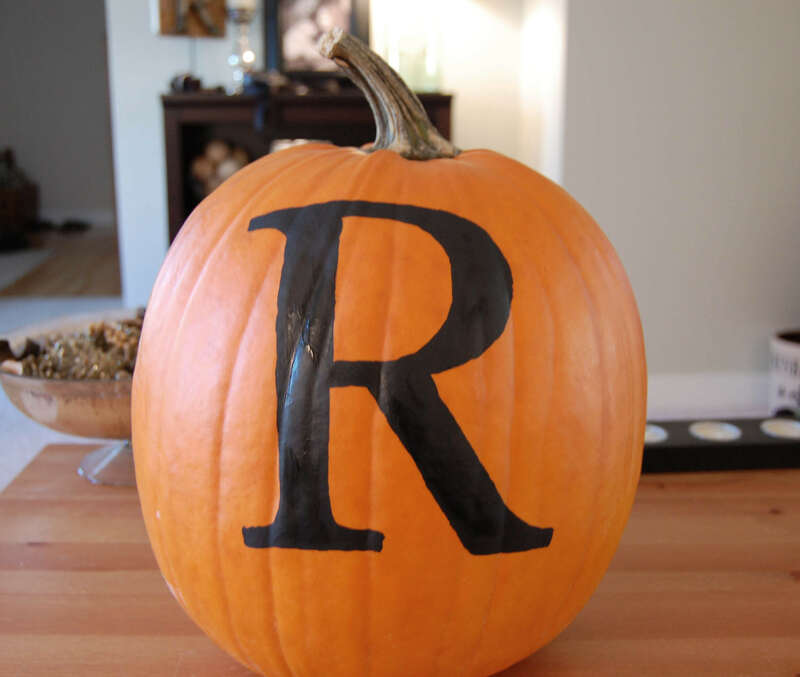 Unless you are an excellent painter try to pick a font that doesn’t have really small curves or swirls on it….it’s way to hard to transfer it on to your pumpkin and still make it look good. 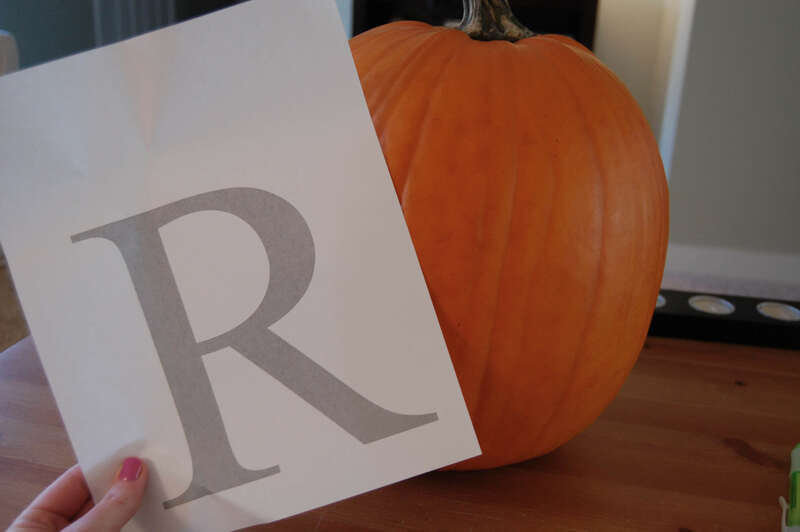 Cut out your letter and tape it to the pumpkin. Then trace it and using your small brush start to paint it. It’s easiest to paint the outline first and then fill in as you go. Be careful not to get paint all over the side of your hand….not that I’m speaking from experience or anything. ahem. Here’s my pumpkin on our porch. My mom picked us up all of these pumpkins from an Amish farm. I’m on the hunt for a big white pumpkin to add to this collection…but they seem to be hard to find! I am obsessed with painted pumpkins this year. Yours turned out amazing. I love it, and it will last so much longer than a carved pumpkin! So cute! I will definitely have to try it out. I love this! I believe I have approximately 16 different decorative uses for pumpkins Pinned on my boards, and this was just added as well! Super cute. Looks perfect! Great job girl! Adorable!! It looks so good on your porch! If I were you I would just paint a pumpkin white…. I think with the shortage of pumpkins around the GR area its your best bet!! LOVE this! I've been stalking all these painted pumpkins on Pinterest so I need to just get with it and do one already. LOVE this! Seems fairly easy; thanks for the tutorial! Julie- there are tons of white (very large white!) pumpkins at Heidi's Farmstand in Lowell. If you are up for a little trip east on 96, it's right off the highway. Thanks for sharing the stencil idea- very cute! Loving the monogrammed pumpkin! I am thinking I definitely need to monogram one of my pumpkins! 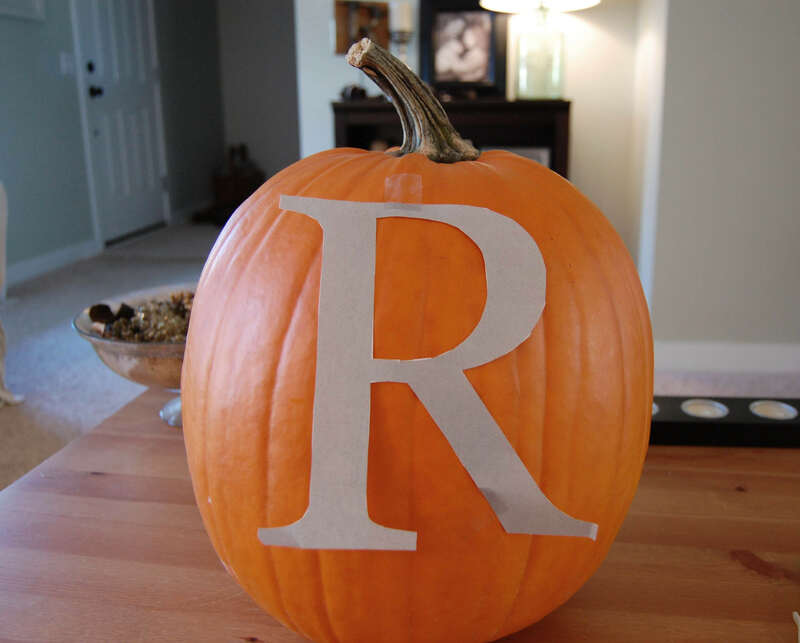 Supper cute..love the R. What about just painting a pumpkin white?